In my article yesterday on the latest announcements concerning the merger of Marriott Rewards and Starwood Preferred Guest, I reported what Marriott’s big chief of loyalty, David Flueck, had told me on the ‘phone on Wednesday: that Marriott is thinking of voiding non-redeemed Marriott Travel Package hotel certificates on merger day, 18th August. Doing a fair like-for-like transition of unused Travel Packages bought under the current scheme will be very hard. 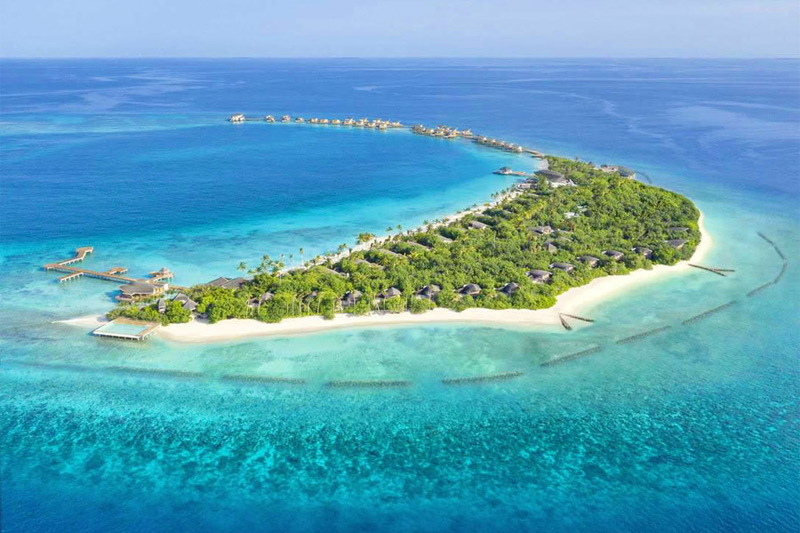 There are currently an astonishing 140 (yes, one hundred and forty) Travel Package price points. There are seven hotel category bands multiplied by four permutations of the miles you receive. This entire structure is then duplicated for three other tiers of airline partners where Marriott gets less generous. On top, there are 28 additional price points for United Airlines members where Marriott has a preferential deal. If existing but unused Travel Package hotel certificates were kept open, Marriott would need to find a fair way of collapsing 140 into 10. Tricky, but not impossible. It gets messier though. Marriott has always allowed you to ‘buy up’ after the initial purchase. If you had a Category 6 package and decided you wanted a Category 7, you could simply pay the extra at the time of the booking. Because there were no refunds the other way (if you bought a Category 7 and ended up redeeming at a Category 6 you lost out) most people just bought the cheapest Category 1-5 package with the intention of upgrading at the time of booking. The requirement to find an equitable way of charging for this after 18th August is probably what is making Marriott think that the best thing to do is clear the decks. So, what happens if an existing Travel Package is refunded? On paper, there are three options. However, I think two are unlikely to happen. At present, if you cannot use a Travel Package within the 12 month validity, Marriott will take pity on you and give you 45,000 points (for a Category 1-5 certificate) as compensation. This is a nice gesture but doesn’t begin to cover your outlay. I would be shocked if Marriott did this and, legally, it would be hard. The second option would be to deduct the current number of points required to redeem for the airline miles you’ve received. For example, imagine you used 270,000 points (see the top chart above) for 7 nights in a Category 1-5 hotel plus 120,000 Avios. Marriott could just reimburse you the difference between the points needed for a direct 120,000 Avios redemption and what you paid. However, that certainly isn’t happening! As you can see from this chart, you would usually need 340,000 Marriott points (140k + 140k + 30k+ 30k) to redeem for 120,000 Avios. 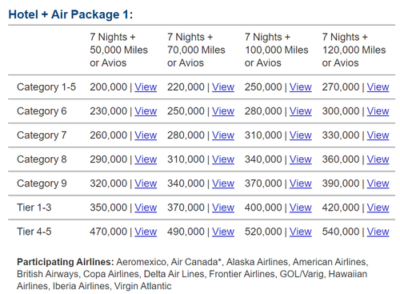 This is why a Travel Package (270,000 points for seven hotel nights AND 120,000 Avios) is such a bargain. We can safely assume this will not be the route taken. Option three is to refund the equivalent number of points that the hotel stay would have needed if booked on its own. You have a Category 1-5 Travel Package and paid 270,000 Marriott points for seven nights plus 120,000 Avios. Marriott would refund you (6 x 25,000 points ie the cost of a Category 5 hotel) which is 150,000 points. You have, effectively, paid just 120,000 Marriott Rewards points for 120,000 Avios. This is an exceptional exchange rate. You have a Category 8 Travel Package and paid 360,000 Marriott points for seven nights plus 120,000 Avios. Marriott would refund you (6 x 40,000 points ie the cost of a Category 8 hotel) which is 240,000 points. Again, you have, effectively, paid just 120,000 Marriott Rewards points for 120,000 Avios. The maths is slightly worse if you redeemed for an airline in the 2nd tier of Travel Packages. Such airlines include Lufthansa / Miles & More, Singapore, Turkish, Qatar, South African, Emirates, Etihad and Air France / KLM. With those airlines you would have redeemed 120,000 Marriott Rewards points for 85,000 miles. The million dollar question – is it worth redeeming for a Travel Package if you have absolutely no intention of using the hotel room? If we knew with 100% certainty that Marriott was going to refund unused Travel Package hotel certificates after 18th August, my advice would be clear – you should be redeeming every single Marriott point you have for a Travel Package in order to pick up some exceptionally cheap airline miles. However, we do NOT know this. 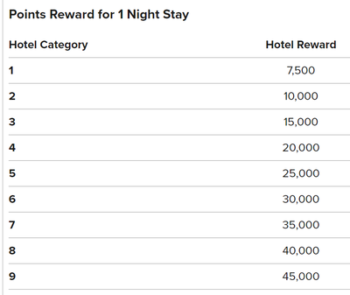 If you redeem 270,000 Marriott Rewards points for seven nights in a Category 1-5 hotel plus 120,000 Avios, and Marriott does NOT choose to void your hotel certificate, you will have either a) some expensive Avios or b) a requirement to spend seven nights in a low end Marriott property. Many people, especially without children, are not very keen on spending seven nights in the same hotel. You may have ended up ‘wasting’ hard earned Marriott Rewards points. I’m certainly not going to recommend what you should do in this scenario. What I WILL say is that there is evidence elsewhere that Marriott is planning to void unused Travel Package certificates. The Starwood official representative on Flyertalk stated it as a fact a few weeks ago, although he is clearly not ‘management’. Other US bloggers have been suggesting the same idea in a way which suggests they have inside information. What David Flueck said to me yesterday – to be clear – is that they were still hoping to find a way of migrating existing Travel Package certificates but that the alternative (voiding them all and doing a refund) is a very real possibility. Given that the new Marriott / SPG scheme will have 110 million members and there are probably less than 1,000 unused Travel Package certificates in circulation you can see why he doesn’t want to spend too much time on this, and would happily ‘overpay’ to refund them at a generous rate to make the problem go away. The current Marriott Travel Packages pricing page online is here. The ‘new scheme’ package pricing is here. Which hotels don't give Avios but DO earn Virgin Flying Club miles? OT – I have tried transferring points from MR to Emirates so I can get the heathrow rewards vouchers, but transfer is still pending – no sign of it on my emirates account. Look like the rewards section for my gold card is now down. I also had to call customers services as apparently I had my emirates account linke dtoa cancelled gold card so it as not linking when I tried. I hope it all get sorted before the promotion is over. Or is there anything I can do about it? Call, call and call again !! That’s the only thing you can try really. See if you can find someone willing to manually make the change. Might have to go up levels to supervisors, call centre manager etc….. Thanks – called. Said it is gone to Emirates so out of their hands. Spoke to emirates, the team that do it is in Dubai, so earliest time it can be updated is tomorrow. Fingers crossed. The SPG cert show up under Earned awards with their validity and that you have to call to book.The SPG certs I got as Plat benefit and one through the EmiratesNBD SPG credit card. The Marriott cert I got through the recent promo for being a new member (which worked for everybody ) The Marriott is an e cert which you can automaticaly apply when you make a reward booking within the category. OT – anyone reckon the fact Norwegian is asking for £859.90 for every single one-way flight LGW-SIN from 13th January suggests their attempt to compete on this route might be coming to an end? Personally worried as my sister is booked on 20th January flight (bought in June for £189) which may ultimately get cancelled if I’m reading the current pricing right (as an attempt to discourage new bookings for now without announcing route cancellation yet). That does seem fishy. There have been anecdotal reports of light loads outside of peak periods. If you have avios you could book economy tickets and cancel for £35 if norwegian don’t can the route. I’ve never flown them but did notice this kind of pricing across the board right before a promotion before. Well you can say that 120k Avios require 340k Marriott points or you could say that 300k Marriott points get you 125k Avios (going through SPG). In any case the argument for Option Two doesn’t change. Which category 1-5 hotels would give over £1,000 of ‘value’ ? I’m sure plenty of Cat 5 hotels average out at around £150 per night at peak times. Stress ‘peak’. They’re now rowing back on this… so could be 18th. That rate code may not be the cheapest though …. It looks like that the bonus points rate is the same as the Best Flexible Rate. There is also a 2K HH bonus points version ( code:PBK2P1) on which rate looks the same or slightly better (Asia). For the uneducated with regards to “travel packages” – if we have booked a 7 night stay with marriott points for January 2019 (just hotel stay) and have the voucher. Is there a risk this will be canned?? Is it still the 4th August because the Amex MR to SPG transfers have been blocked until the 8th August now so I can’t get a Travel Package because I need to move some Amex points into SPG in order to have enough Marriot Rewards points ???? Anyone had their SPG account to account done recently? been waiting 5 working days and I know there were some others? I have been trying for last 2 weeks and nothing seems to be working for me. I transferred points from SPG to Marriot & Marriott to SPG all week and worked fine for me. So far on hold for 45 min to try and book travel package! Anyone know a better number to use? (currently using 00800 228 21000 from the Marriott travel packages website page). Planning to go for Cat 6 w/132k UA miles – looks like all the Melbourne properties will become Cat 5 under new scheme so if mapped across then should still do the trick and have a use for the voucher. If not given decent points redemption instead then will happily accept them and probably go Airbnb route! You could try 020 7012 7312 which is the one that I have used to transfer points, but worth a try. Thanks, will try that number tomorrow. Theoretically the one above is the Gold line but gave up after 65 min on hold! I always use the number Mark gave you. Never had a problem getting through and they are very competent and friendly in my experience. That was like night and day! 10 min on hold then very helpful Irish CS rep answered, she had everything sorted within 60s! Out of interest, she said points across to UA within 3 days and cert on the account for a year, no mention of the upcoming changes. Incredible speed on the UK number. Everything sorted in less than 3 minutes total time on the phone. Just logged in to Amex to transfer some Amex MR into my SPG account in order to have enough for a Marriott Travel Package and an alert on the screen tells me that transfers are suspended until 8th August. Thoroughly disappointing 🙁 Left it too late I guess. Great post! But I suspect you’re off by an order of magnitude on the number of unattached travel packages. I think I am one of the 1000 with an unused travel package. As I am away from the UK at the moment I doubt I’ll be able to redeem before 18 August. Hoping they overpay to make problem me go away! Also got my Avios when there was a BA transfer promo so actually got 165000 avios! Took a punt on Friday. Called the 020 number and was sorted in 10 minutes. Category 1-5 with 120,000 and Avios posted to my BA account today!